How was ACP's 2015 Leadership Day different from all others? Following the repeal of the sustainable growth rate, ACP seeks to secure its future through other legislative and regulatory goals, including physician payment reform, graduate medical education, and primary care workforce programs. Notwithstanding my Irish-Catholic upbringing, I have been fortunate to have been invited over the years to join in Passover Seders with my Jewish friends. One of the many wonderful Seder traditions is when the youngest person present asks, “Why is this night different from all other nights?” followed by older members of the family recounting the story of the Jewish people's exodus from Egypt. While I'm by no means comparing a legislative change in Medicare payment policies with a celebration of the Jewish people being liberated from slavery, it occurs to me that one could ask of ACP's 2015 Leadership Day on Capitol Hill, held in mid-May, “Why was this Leadership Day different from all others?” The answer is that this was the first time since 2001 when ACP members were not being asked to go to Capitol Hill to seek repeal of the sustainable growth rate (SGR). When President Obama signed the Medicare Access and CHIP Reauthorization Act (MACRA) into law on April 16, it put a stop to 14 years of real cuts (in 2002) or scheduled cuts (every year since then) in payments to physicians. These cuts required 17 temporary patches to stop. But the SGR has been repealed, and goodbye and good riddance to it! Almost 300 ACP members from 44 states and the District of Columbia, which included 49 Medical Student and 53 Resident/Fellow Members, would actually get to talk about something other than the SGR when they met with their members of Congress on May 21. Of course, the SGR was not entirely forgotten. The first thing that the attendees did was thank their representatives and senators for repealing the SGR, except for the handful who voted against it. But then they pivoted to what we really wanted to talk about: the need for Congress to continue the Medicare Primary Care Incentive Payment Program, to restore Medicare-Medicaid pay parity, and to strategically increase funding for graduate medical education (GME). MACRA solved the most pressing physician payment problem, repealing the flawed SGR formula. But Congress' work on fixing the physician payment system is far from complete. One item requiring immediate attention by lawmakers is the Medicare Primary Care Incentive Payment Program, which has been paying internists and other primary care physicians a 10% bonus on their office visits and other designated services since 2011. Created by the Affordable Care Act (ACA), the program will sunset at the end of this year unless Congress votes to reauthorize it. 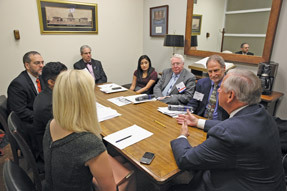 Leadership Day attendees explained to lawmakers that allowing the program to lapse is contrary to MACRA's promise of “stable and positive” updates during a transition period to new payment models, because if it expires, primary care physicians will be subjected to an average annual cut of almost $4,000 in Medicare payments in 2016 and subsequent years, compared to current payments. 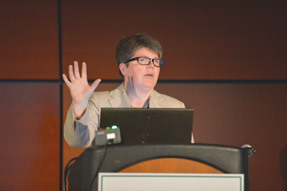 Allowing such a cut to go into effect, they argued, would make it more difficult for primary care physicians to make the investments in their practices needed for them to do well under the new Merit-Based Incentive Payment System and alternative practice model options created by MACRA and to achieve its cost-saving goals. Another piece of unfinished business is Medicare-Medicaid primary care pay parity. In 2013 and 2014, this program paid internists (including internal medicine subspecialists), family physicians, and pediatricians no less than the Medicare rates for designated services provided to their Medicaid patients. Congress allowed it to sunset at the end of last year, resulting in an average 40% cut in Medicaid payments for the designated services. With Medicaid now the single largest source of coverage in the United States, with over 65 million people enrolled, Leadership Day attendees told Congress that restoring Medicaid pay parity is essential to ensuring continued access for this vulnerable population. The societal benefit of Medicare funding for GME has been called into question by an influential report from the Institute of Medicine, which recommended that funding remain flat for a decade (adjusted only for inflation) and that a portion of that funding be put into a performance-based “innovation fund.” Flat GME funding, Leadership Day attendees told lawmakers, is acting as a chokehold on medical school graduates being placed in residency positions, making it nearly impossible for programs to expand positions for internal medicine and other specialties. ACP's Leadership Day attendees urged their lawmakers to co-sponsor several bills to strategically increase GME funds, allowing expansion of residency positions in the specialties with the greatest need, including internal medicine. They also urged Congress to fund a National Health Care Workforce Commission. This appointed blue-ribbon advisory commission was authorized by the ACA, but it has been unable to meet because Congress has refused to fund it. The result is that the federal government spends billions on GME and workforce programs without any expert analysis from the commission of how to spend those dollars most prudently. After their visits, Leadership Day attendees reported that many legislators from both parties were unaware that the Medicare Primary Care Incentive Payment Program was soon to sunset and asked for more information on how they could help continue it. There was interest in but less of a bipartisan consensus on the need to restore Medicare-Medicaid pay parity. Almost all were interested in learning more about ACP's recommendations on sustaining and prioritizing GME funding. As the SGR taught us, getting legislation enacted takes doggedness in urging Congress to do the right thing, no matter how long it takes. One can hope that Congress will act much faster on ACP's post-SGR legislative priorities, especially those facing a deadline like the Medicare Primary Care Incentive Payment Program. But at the very least, because attendees were able to talk to lawmakers about something other than the SGR, Leadership Day 2015 may have planted the seeds for future legislative victories to take root and bloom.